Creamy spinach artichoke dip and crispy loaded baked potato skins join forces, resulting in the ultimate party appetizer! 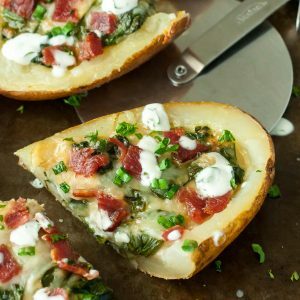 We LOVE these loaded spinach artichoke potato skins! Depending on the size spud you have handy, this recipe will make 4 large spinach artichoke potato skins or 6-8 small ones! In a medium pan or skillet, saute diced onion in 1 tsp of olive oil until tender, adding the garlic towards the end. Next add the spinach [in batches] and stir into the onion and garlic, allowing the heat from the pan and veggies to wilt the spinach. Season with salt, pepper, and garlic powder, then add both cheeses and chopped artichoke hearts. Stir and set aside. Once your potatoes are ready, allow them to cool before slicing in half lengthwise. Scoop out the centers and set aside, leaving a portion of the potato around the edges to keep them together. I like to score an oval in the center using a knife before scooping to ensure pretty potato boats every time. Brush the edges with olive oil and fill each potato skin with spinach dip. Top with crumbled bacon and bake on the center rack for 15-20 minutes until they reach cheesy, crispy perfection. Garnish with chopped parsley and green onion and drizzle with sour cream or Greek yogurt! Waste not! Use the leftover potato scooped from the skins to make a small batch of mashed potatoes or even stir it into your favorite soup. Recipe yields 4 large potato skins or approx. 6-8 small loaded potato skins. This recipe is easily doubled or tripled to feed a crowd!